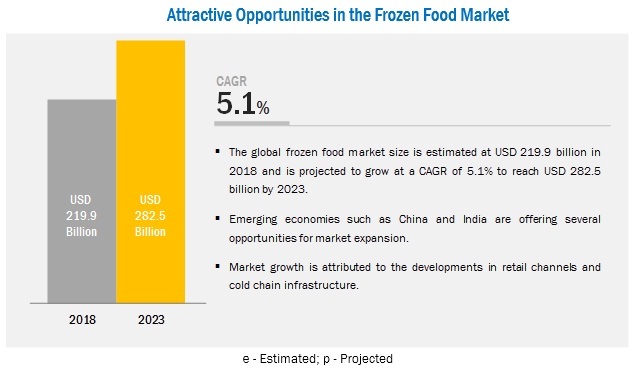 [157 Pages Report] The frozen food market is estimated to account for about USD 219.9 billion in 2018 and is projected to reach a value of about USD 282.5 billion by 2023, at a CAGR of 5.1%. 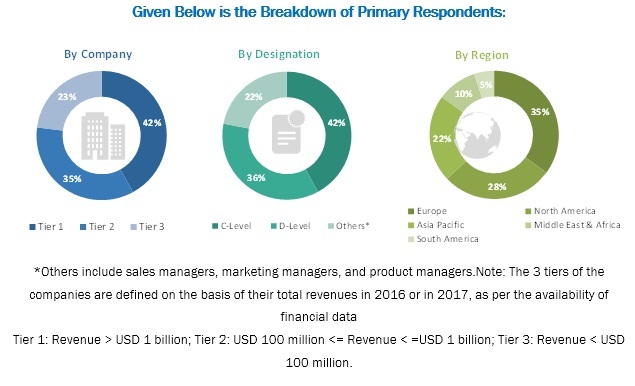 Developments in the retail landscape, rising demand for convenience food, and technological advancements in the cold chain market are the major driving factors for the market. On the other hand, the rising preference for fresh and natural food products is a restraining factor for the frozen food market. The key players in this market include General Mills Inc (US), Conagra Brands, Inc. (US), Grupo Bimbo S.A.B. de C.V. (Mexico), Nestle SA (Switzerland), Unilever (the Netherlands), Kellogg Company (US), McCain Foods Limited (Canada), Kraft Heinz Company (US), Associated British Foods plc (UK), Ajinomoto (Japan), Vandemoortele NV (Belgium), Lantmannen Unibake International (Denmark). These players are focusing on improving their presence by undertaking acquisitions, expansions, and developing products specific to the requirements of consumers and their preferences. These companies have a strong presence in Europe and North America. They have also set up manufacturing facilities in various regions and have strong distribution networks. In June 2018, Lantmännen Unibake opened up a new production plant in Nowa Sól, Poland to increase its production capabilities. In October 2018, Conagra acquired Pinnacle Foods Inc. (US); the acquisition helped Pinnacle foods to widen its frozen meals & snacks and sweet treats categories. In September 2018, Grupo Bimbo added four frozen bakery lines to its Argentina plant. This step was taken to increase the export business of the company in neighboring countries such as Chile. In November 2018, Nestle launched Wildspace, a range of healthy frozen meals in reusable and recyclable containers. Wildscape meals include six different varieties, such as the gochujang cauliflower with Brussel sprouts, quinoa, chickpeas, pickled onions, riced cauliflower, and cashews. In May 2018, Nestlé launched meat-free brand—Garden Gourmet—in the UK. Garden Gourmet offers healthy meat-free products and is expected to strengthen the frozen ready meals segment in the UK. 12.3 Grupo Bimbo S.A.B. De C.V. The study involves four major activities to estimate the current market size of the frozen food market. Exhaustive secondary research was done to collect information on the market, the peer market, and the parent market. These findings, assumptions, and the market size was validated with industry experts across the value chain through primary research. Both the top-down and bottom-up approaches were employed to estimate the complete market size. Thereafter, the market breakdown and data triangulation were used to estimate the market size of segments and subsegments. The frozen food market comprises several stakeholders such as manufacturers; importers & exporters; traders; distributors; and suppliers of frozen food; food safety authorities; food technologists; food product manufacturers; raw material suppliers; and regulatory bodies such as the Food and Agriculture Organization (FAO), Environmental Protection Agency (EPA), the Food Safety Council (FSC), government and research organizations, trade associations, and industry bodies. The demand-side of this market is characterized by the rising awareness of shelf life extension among food product manufacturers. The supply-side is characterized by advancements in technology and diverse application industries. Various primary sources from both the supply and demand sides of the market were interviewed to obtain qualitative and quantitative information. 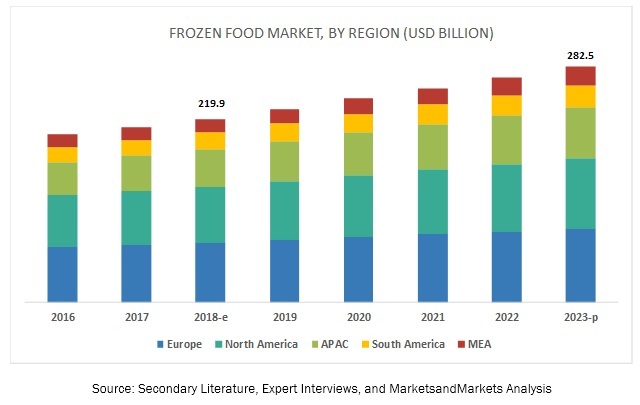 The value chain and market size of the frozen food market, in terms of value, were determined through primary and secondary research. After arriving at the overall market size from the estimation process described above, the total market was split into several segments. To complete the overall market engineering process and arrive at the exact statistics for all segments, the data triangulation and market breakdown procedures were employed, wherever applicable. The data was triangulated by studying various factors and trends from both the demand and supply sides. In addition, the market size was validated using both the top-down and bottom-up approaches. It was then verified through primary interviews. Hence, three approaches were adopted-top-down approach, bottom-up approach, and the one involving expert interviews. Only when the values arrived at from the three points match, the data is assumed to be correct. This research report categorizes the frozen food market based on product, consumption, type, distribution channel, and region.